Beijing’s courting of the Arakan National Party underscores how China is taking steps to protect its most strategic investments in Burma ahead of the election. KYAUKPHYU, Arakan State — A powerful ethnic nationalist politician from one of Burma’s poorest and most volatile regions said Chinese officials made him an irresistible offer during a recent visit to the country: Ask for anything, and we’ll give it to you. Beijing’s courting of Aye Maung, chairman of the Arakan National Party (ANP), underscores how China is taking steps to protect its most strategic investments in Burma—twin oil and gas pipelines and a deep-sea port—ahead of an unpredictable election in the Southeast Asian nation next month. Such willingness to engage with opposition parties to secure its investments overseas represents a major shift in China’s non-interventionist foreign policy. The ANP, an organization of ethnic Arakanese Buddhists that is riding a tide of anti-Muslim sentiment, is poised to make a near-clean sweep of Arakan State in Burma’s first free and fair election in 25 years. There is speculation that Aye Maung could win the powerful post of chief minister of the state. That makes him a key potential ally for Beijing, whose most important Burma investments are located in the western state. The fishing town of Kyaukphyu, racked by violence three years ago between ethnic Arakanese Buddhists and Rohingya Muslims, is at the heart of China’s drive for new resources and trade routes. In particular, new oil and gas pipelines from Kyaukphyu connect China’s southwestern province of Yunnan directly with the Indian Ocean, bypassing the narrow Malacca Strait, where a strong US naval presence has long worried Chinese policymakers. According to Aye Maung, the ruling Chinese Communist Party invited him to visit Fujian and Guizhou provinces in July. At one meeting, he says an official from the party’s International Department told him China had only engaged with President Thein Sein’s ruling Union Solidarity and Development Party (USDP), Aung San Suu Kyi’s National League for Democracy (NLD) and the ANP. “They told me: We have connected with three parties. You are the one party from all the ethnic groups in Myanmar,” Aye Maung told Reuters in an interview in Ann, a town near Kyaukphyu, where he was campaigning. Aye Maung’s two trips were covered in brief reports by local media in China and Burma, but no other accounts of what was discussed in his meetings have been made public. The Communist Party’s International Department did not respond to a faxed request for comment. Calls by telephone went unanswered. 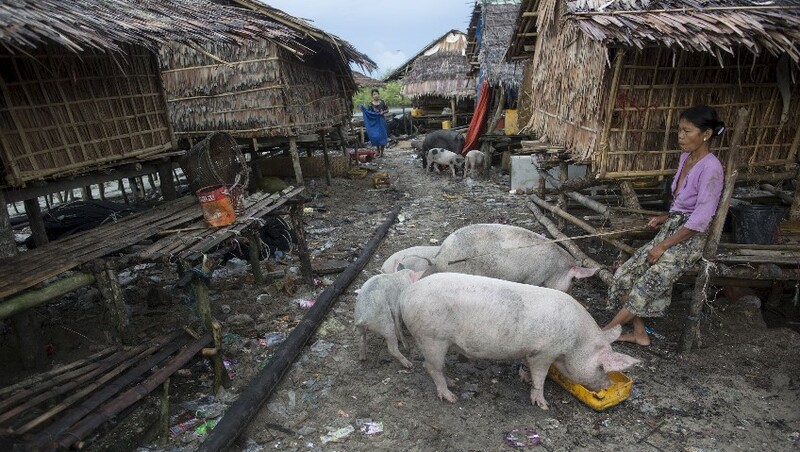 A woman feeds her pigs at her home in Kyaukphyu Township, Arakan State, on October 6, 2015. A senior official from Thein Sein’s office said the Burmese president had encouraged ties between China and NGOs and rival political parties in Burma. “I think their trying to improve ties with the ANP is just a part of developing this new policy,” the official, Zaw Htay, told Reuters. For decades, China has relied on a simple formula for its foreign policy: Avoid anything that could be seen as interfering in a country’s domestic politics. But now, analysts say there is a growing belief in Chinese President Xi Jinping’s administration that the old doctrine is insufficient to protect Beijing’s interests. “In recent years, we suffered great losses in only dealing with ruling parties, so that required us to make a change,” said Xu Liping, head of the department of Asia-Pacific Social and Cultural Studies at the Chinese Academy of Social Sciences, a top government think-tank. In June, Xi hosted Nobel laureate Suu Kyi. Ties between Beijing and its southern neighbor were close when Burma was under military rule and treated as a pariah state by Western nations. But in 2011, when the junta ceded power to a quasi-civilian government, China was stung by Burma’s sudden suspension of the Chinese-led US$3.6 billion Myitsone dam project in the northern state of Kachin following a public outcry over its environmental impact. The event prompted Beijing to tweak its policy on Burma. “It was a heavy blow to the Chinese government,” said Xu. Aye Maung said he has not responded specifically to China’s offers of help. But he said he would like tractors and farm machinery to help with Arakan State’s harvest, and had also discussed student scholarships. Arakan State could certainly use the assistance—the state has a poverty rate of 78 percent, according to a 2014 World Bank report. But although securing much-needed investment could strengthen Aye Maung’s hand at home, accusations of land grabs and environmental destruction have fueled anti-Chinese sentiment in Burma, and embracing Beijing is not without risk. Chinese investments in Kyaukphyu could amount to nearly $100 billion if all the current plans, including a special economic zone, materialize over the next two decades, according to C. Raja Mohan at the Carnegie Endowment for International Peace. But residents say the oil and gas pipelines built so far have not given them any jobs. Top Photo - ( JPaing / The Irrawaddy ) The chairman of the Arakan National Party, Aye Maung.